Link Generations has been selected as one of five Programs of Distinction by Generations United. The designation serves as the U.S. benchmark for intergenerational programs and is based on the criteria that underpin the effectiveness of high-quality intergenerational programs. We create social and educational programs that connect older adults with adolescents to promote emotional and psychological health for both populations. Read more about Link Generations Summer Storytelling Series at Ingleside at King Farm in the Washington Post. Link Generations provides education to all age groups about aging. The more you know and understand about what someone else is experiencing, the more comfortable you will be interacting with him or her. Get tips and resources on how to talk to older adults with cognitive decline. Link Generations provides opportunities for high school students to learn about gerontology, plan meaningful activities to help older adults with cognitive decline, and earn social service learning hours required for graduation. The program is designed as an after-school club to expose students to the field of gerontology while giving them leadership opportunities and social service learning hours. Students convene after school to plan structured activities appropriate for elderly residents in nearby assisted living facilities. Expected outcomes for youth are improved self-esteem, increased comfort in working with older adults, and learning about history. Link Generations addresses a growing need in the community to provide meaningful and stimulating activities for older adults with cognitive limitations. As the population ages, we will need more people knowledgeable and trained to work with aging adults. Older adults and adolescents face similar developmental issues such as changes in identity, independence, and depression. 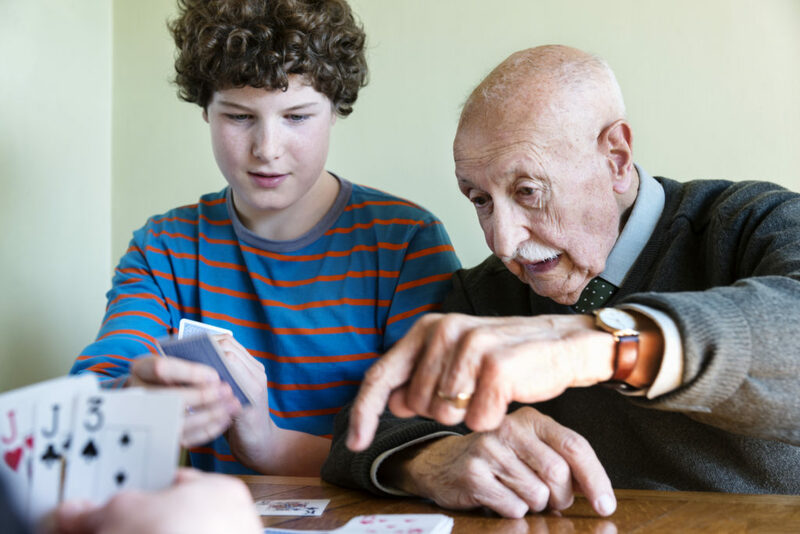 Intergenerational activities connect adolescents and older adults and provide opportunities to focus on these shared issues. Expected outcomes for older adults are feeling a sense of purpose, connection to others, and cognitive stimulation. As part of the after-school program, students are trained in basic principles of adult development and aging as well as practical techniques for working with older adults who have cognitive and physical limitations. Students design activities that target cognitive stimulation, social interaction, and physical movement. Examples of activities are music, life story telling, art/coloring, and dance. Students are encouraged to draw on their own interests in these areas to help them feel comfortable working with older adults.